And, it happens again. The UFC Middleweight Title bout between Anderson Silva and Vitor Belfort, that has already been pushed back from two previous events, is now no longer going to take place at UFC 112 in Abu Dhabi, as Belfort has now come up with an injury in training. The breaking news comes from a Tweet by Yahoo! Sports writer Kevin Iole, who stated he confirmed Belfort’s injury with UFC President Dana White. Silva had finally gotten healthy after elbow surgery, which had pushed back this matchup from a possible UFC 108 and UFC 109 headlining spot. With Belfort now out and Silva uninjured, the speculation will move to Chael Sonnen possibly getting his shot earlier. The hang up to that happening is the fact that he is on medical suspension until next month and would only have a month to prepare for his first Title fight. UFC 112 was set to feature this Title bout along with a UFC Lightweight Title bout between B.J. Penn and Frankie Edgar. Now, the UFC’s first trip to the United Arab Emirates may be left with just one until further notice. Analysis: This is a highly unfortunate development. After getting past UFC 108 and UFC 109 it was time to look forward to a number of great MMA fights, including every UFC Title on the line by this Summer. While Sonnen would be a deserving replacement after his victory over Nate Marquardt, this fight with Silva and Belfort was looking to be a very exciting fight, with many giving Belfort’s hands a good shot at a possible upset over “The Spider.” If they don’t put Sonnen into this slot and have to push Silva back to another card, it will be an unfortunate blow to what is looking to be an awesome fight card in Abu Dhabi. 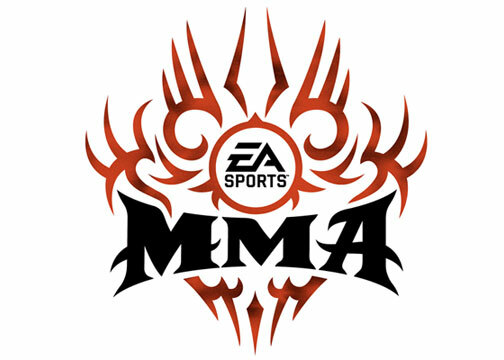 “EA Sports MMA,” a soon-to-be-released rival title to the UFC and THQ’s bestselling “UFC Undisputed” franchise, will be a phenomenal game that could revolutionize the MMA-videogame industry. That’s the word from MMA legend Ken Shamrock, who’s admittedly a bit biased since he’s in the EA Sports game. Shamrock, who told MMAjunkie.com Radio (www.mmajunkie.com/radio) he became “unglued” when he saw his likeness on a World Wrestling Federation figurine, said he’s even more excited about the highly anticipated videogame. EA Sports releases the game, which is available on the PlayStation 3 and Xbox 360 platforms, later this summer. And despite the “UFC 2009 Undisputed” game already selling 3.5 million copies and the 2010 version hitting stores in May, Shamrock thinks “EA Sports MMA” – which features many Strikeforce and DREAM fighters, as well as some early MMA stars – will have a big impact. Shamrock, of course, is excited to see his likeness in the game alongside those of Fedor Emelianenko, Dan Henderson, Gegard Mousasi, Cung Le, Gilbert Melendez, Frank Trigg and dozens of others, including Ken’s adoptive brother, Frank Shamrock. Despite the UFC having a stronghold on the world’s top talent and featuring them in “UFC Undisputed,” EA Sports has put together a solid roster of other fighters. Shamrock, who parlayed his early UFC dominance into a contract with the WWF (now known as the WWE), said a trip to the toy store gave him his first taste of merchandising fame. “When I was in the WWF, I actually walked into a Toys’R’Us store when I was going Christmas shopping for my kids,” Shamrock said. “And I actually saw a doll of me on the shelf. Of course, Shamrock is also happy to sign a contract with EA Sports to assure the videogame has “Ken Shamrock” and not a similar-looking character named something like “Ken Slam-rock.” Shamrock, who’s long had a big following in Japan thanks to his Pancrase and PRIDE fights, once learned that the country had comic books and cartoons based on him. He said they’d have his trademark garb – red trunks, red knee pads and red wrestling shoes – and even his hair, distinct jawline and muscular frame. Bisping…Dont watch this video before UFC 110. You might crap yourself! The now legendary battle between Joe Rogan and “the spilled bag of ice” at UFC 109 has taken a bizarre twist. 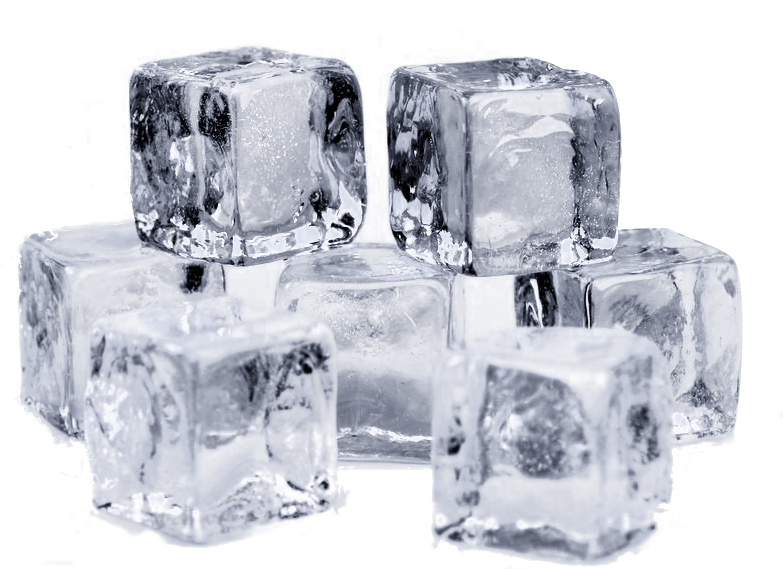 Even though Rogan relentlessly pounded the spilled ice with a verbal onslaught of spinning back pro-nouns and rear naked adjectives ,The spilled bag of ice has set up a twitter account to try and squash the beef. Follow The bag of ice and Joe rogan on twitter to get the live feeds! Few battles inside the Octagon on Saturday night were as heated or personal as the one between Joe Rogan and the bucket of ice accidentally spilled between rounds during the undercard on Spike. 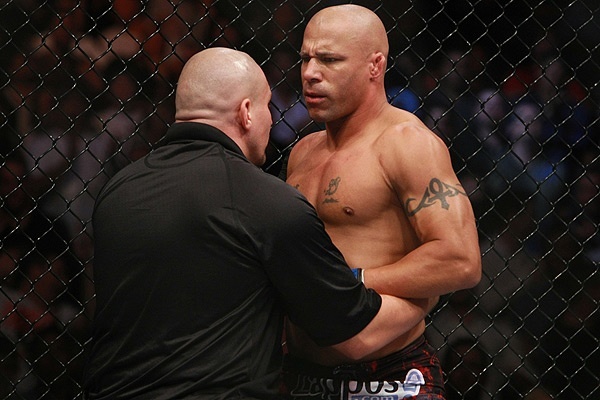 It’s two and out for UFC welterweight Frank Trigg after his Ultimate Fighting Championship return. After posting a 6-1 record to earn his way back into the organization and signing a new deal with the UFC in 2009, Trigg was notified on Monday that he had been dropped from the UFC after a knockout loss to Matt Serra at this past weekend’s UFC 109 event. Trigg confirmed the news with MMAjunkie.com (www.mmajunkie.com) on Wednesday. Trigg said he held off on sharing the news until he could notify family members. He said he’s undecided if he’ll pursue opportunities outside the organization. The former University of Oklahoma wrestler and PRIDE veteran suffered a TKO loss to Josh Koscheck in September; it was Trigg’s first fight in the UFC since a submission loss to Georges St-Pierre at UFC 54 in 2005. With that loss and the subsequent first-round stoppage defeat to Serra, UFC officials elected to cut Trigg from its welterweight roster. Following that first UFC stint that ran from 2003 to 2005, which included a pair of title losses to then-champ Matt Hughes, Trigg (19-8 MMA, 2-5 UFC) fought for organizations such as Strikeforce, World Victory Road, HDNet Fights and ICON Sport, where he defeated Jason “Mayhem” Miller for the organization’s middleweight title. The 37-year-old fighter and broadcaster then found a new life when he returned to the 170-pound division and strung together wins over the likes of Edwin Dewees, Makoto Takimoto and Falaniko Vitale to earn the new UFC deal. However, as with most fighters, the back-to-back losses prompted the walking papers. As MMAjunkie.com reported earlier today, the UFC also dropped UFC 109 headliner Mark Coleman and heavyweight Tim Hague following the Feb. 6 event. Phillipe Nover’s termination has also since been confirmed. UFC middleweight Michael Bisping (18-2 MMA, 8-2 UFC) was well on his way to a middleweight title shot with three straight octagon victories before Dan Henderson knocked him out clean at UFC 100. A devastating knockout could reasonably sap the confidence of any fighter. But Bisping, an innately self-assured fighter, said he was humbled by the loss and had moved onward and upward. Now heading into a fight with Wanderlei Silva at UFC 110 that could move him within striking distance of contendership, Bisping on Wednesday said he is more motivated than ever to prove he belongs at the top of the 185-pound division. And contrary to popular belief, Bisping said, he was humble enough to learn that lesson. 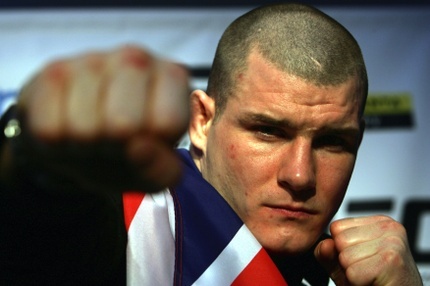 Bisping expressed irritation at the scolding he received for the UFC 100 performance in which he circled into Henderson’s powerful right hand and set the stage for the knockout. “It kind of pisses me off, people going into that all the time, as if I’m stupid,” he said. “Obviously when you’re fighting an opponent, you move to their weak side because they’re not going to do that; you go the opposite direction. That instinct, he said, may have been rooted in his previous fight against Chris Leben, a southpaw with a big left hand. Bisping surprised many in his most recent fight by taking down veteran fighter Denis Kang and pounding him out after landing on his back early at UFC 105 this past November. The performance won him a “Fight of the Night” bonus, his second such honor. Going into the fight with Silva – a Tasmanian devil of aggression – Bisping said defense is a top priority in camp. “Before that fight (with Henderson), I was of the impression that I could go out there and stand with anyone for three rounds and not get knocked out,” Bisping said. “I’m not saying I would have beaten [Henderson], but I certainly believed that I could go out there and stand with him for three rounds and not get knocked out. And no one could be more qualified to help Bisping tighten up his defense than Quinton “Rampage” Jackson, a training partner since late 2006 who fought Silva on three different occasions and knocked him out at UFC 92. Bisping said Jackson has been with him in Sydney several weeks and will be in his corner on Feb. 21. The Brit said he won’t be bullied by his opponent’s Blitzkrieg style. “Wanderlei’s a strong clincher, but I’m planning on standing toe to toe and beating him head on,” Bisping said. Although he stumbled on the way up the middleweight ladder, Bisping said he embraced the cliché that fighters learn from their losses. Subscribe to MMAGE blog Today ! UFC 47 – It's On!